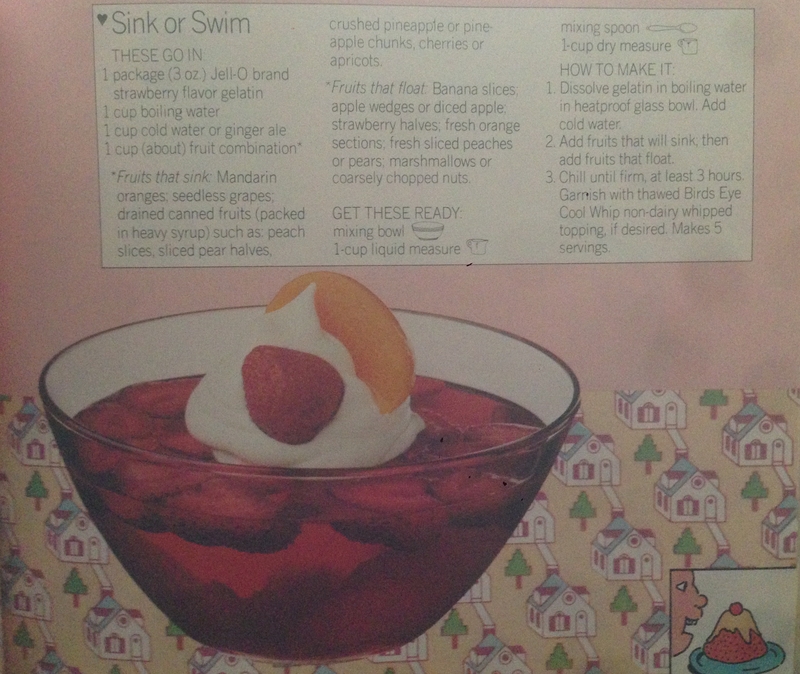 It’s impossible to look through this 1977 Jello cookbook (from the General Mills folks), and not feel transported to a different time. 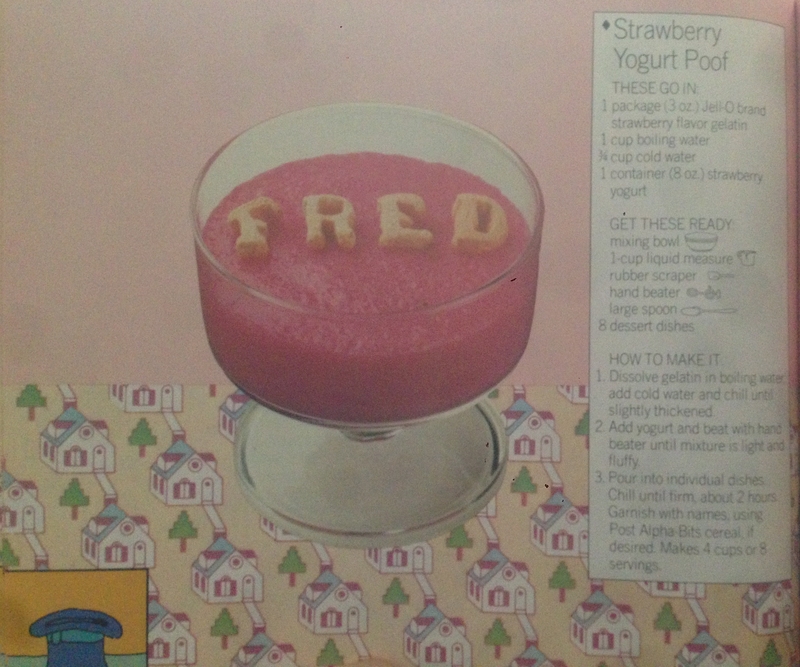 A time when someone might spell your name in frosted alphabet cereal letters…. 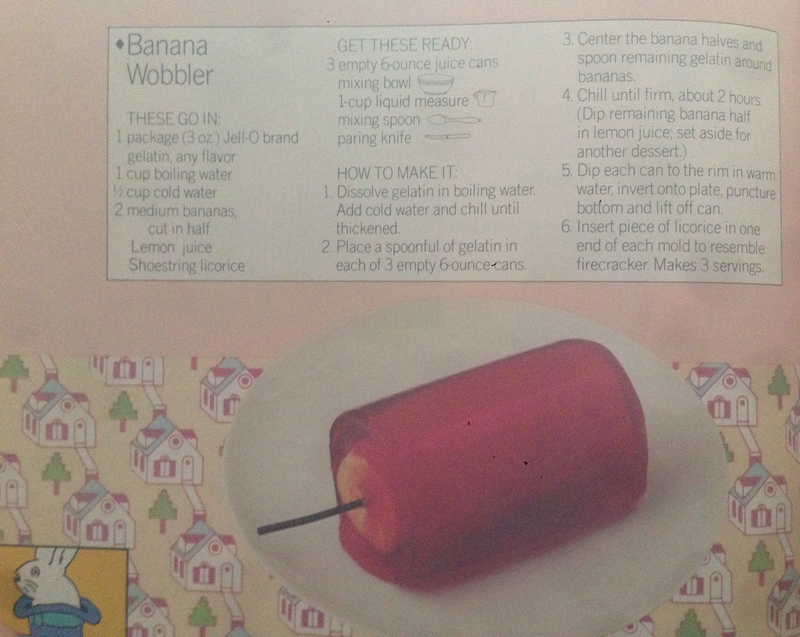 A time when someone thought encasing a banana in jello and putting it on a stick was a really nifty trick. 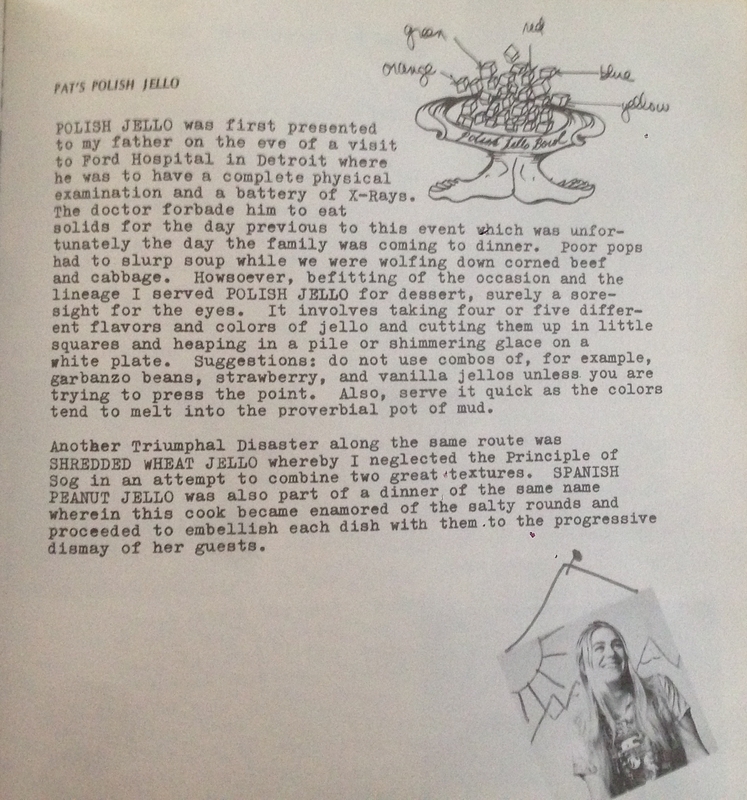 This book reminded me of Pat Oleszko’s contribution to an even earlier cookbook, my own Mmmmm (published in 1972). With the aim of serving her hospital-bound dad something completely without texture, we made several different kinds of jello, cut them into little 2-inch squares, and piled them into a wobbly haystack. This was followed by… really?… shredded wheat jello. I remember that GM book as a child. I was fascinated by the corners of the book, which were a flip book (one of a rabbit going in and out of a hat and the other was a child eating dessert). Our local art gallery had Art Mart every year, and one year there was a blue jello pool with goldfish – think early 70’s – they let the kids play in and eat out of it! My all-time favorites from the 60’s: my mom’s “gelatin salad” made with one box lemon jello, one bottle Del Monte Chili Sauce, one can crushed pineapple. I’m pretty sure no one has eaten that in decades. But topping that, and never made by me, was the recipe for a White Jello Wedding Cake, made in a mold to resemble a layer cake. Ruth, I bet you have that jello cookbook too. Growing up during WWII days, we always ate jell-o as well as singing the song J-E-L-L-O! (the sponsor of the Jack Benny Show) until my mother yelled, “Stop.” Much later, driving my almost-college age daughter around the country to look at possible colleges, we came across the famous jello bar in Minnesota and stopped in to find it a cafeteria of jello – I’d sweat 150 different kinds. What a jewel but I think it’s out of business. As a kids in the 50’s and 60’s we used to eat Jello straight from the box! Part of the fun were the colorful tongues of red, yellow, orange, and green. Don’t think blue had been invented yet. Surely everyone has a good memory of Jello. When my kids were young I made Jello cubes adding cream and the layers separated into two. Lime was our favorite (well, it was mine and I was making it). Finger food Jello! What can be better? I remember drinking warm jello as a kid when I was feeling under the weather. Anyone else? 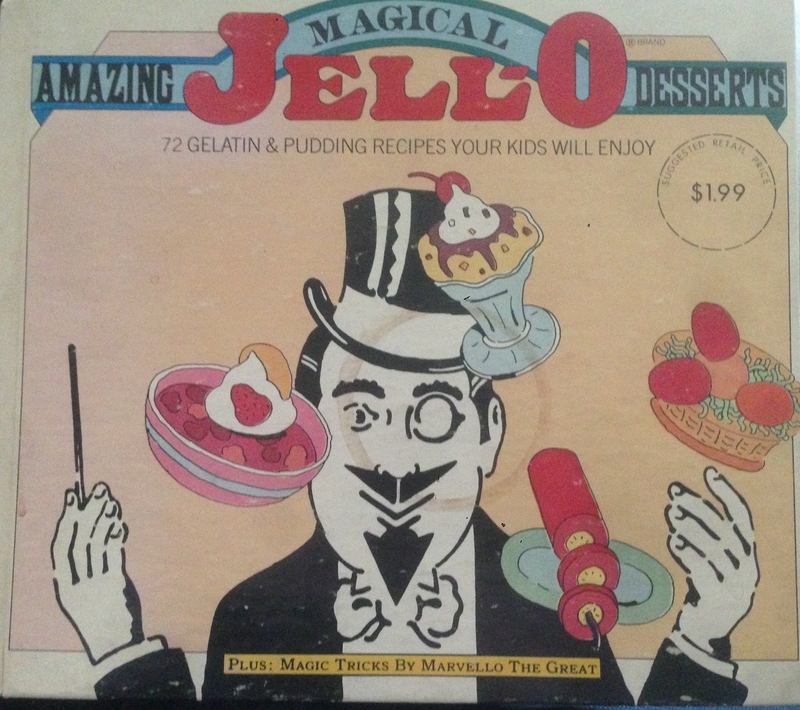 I loved Jell-O as a kid–made by anyone but my mom. Hers always had a film on it that was not soft and required chewing. Concentrated chewing! Blech. I loved Jello as a kid in the 50s and 60s. My favorites were cherry and grape. I would shake them in my mouth until the Jello became liquid. All through the 60s our church in Minneapolis had a stewardship dinner and faithfully served cherry Jello with miniature marshmallows and bananas. A big winner. Remember Jello no-bake applesauce “cake” with graham crackers? The whole thing gets frosted with whipped cream or whipped topping so nobody knows the layers will be the colors of 2 different flavors of Jello.